Ensure their pup has all the necessary vaccinations, preventative medications, and annual wellness exams. Give their pup plenty of exercise, socialization, and obedience training. Feed their pup a nutritious and balanced diet. This third point isn’t as simple as it sounds. Think of the enormous selection of dog food brands at any pet store or online retailer like Amazon. Which one should you choose? Thousands of pet owners choose Nulo dog food. This brand offers 100% balanced and complete nutrition for adult dogs of any breed or size. Read on to learn more about this product, the company that creates it, and the pet owners who buy it for their dogs. Nulo is based in Austin, TX, a city known for its pet-friendly and active atmosphere. The company began in 2010 by CEO Michael Landa. He was inspired to create a holistic dog food brand after noticing an increase in the number of overweight and diabetic dogs at his professional dog-walking and pet-sitting company. The company began selling Nulo products in certain niche stores around Austin, like Whole Foods. Then, the brand began to grow in popularity. It gained support from many people, including high-level performers like Ironman competitors, Olympians, and CrossFit athletes. Market research actually shows that premium “natural” dog food brands have been exploding in popularity over the last decade. Pet owners are starting to care more and more about what their animals are eating. Mass-produced bargain brand food just isn’t making the cut when it comes to optimizing a dog’s well-being. As it turns out, this was good timing for Landa. These days, you can buy Nulo online and in retail stores across the United States. Nulo pet food (now for dogs and cats) has been crafted to deliver premium nutrition for pets. It’s free of fillers, artificial preservatives, food dyes, and other additives commonly found in mass-marketed brands. The higher-end animal sources provides your dog with amino acids and protein. These are needed to support healthy muscle, cellular repair, and the growth of other important substances including enzymes, hormones, antibodies, and more. The carbohydrates contained in this food are low-glycemic. This means that they won’t spike your dog’s blood sugar when he eats. This helps manage diabetes in dogs and can also help prevent your dog from developing diabetes in the first place. A lower-carbohydrate diet can also help your dog maintain an ideal weight. Nulo dog food contains a lot of vitamins and minerals, like essential fatty acids, zinc, iron, Vitamin C, Vitamin B12, and folic acid. These are important for your dog’s health and support a strong immune system, healthy joints, and a healthy skin and coat. Nulo Adult Dry Dog Food also contains patented probiotics that support immune health, gut health, and help prevent yeast infections. One thing you may notice missing from their FreeStyle ingredients list is chicken and egg proteins. This is because many dogs are allergic to chicken and egg products. Others may develop sensitivity to these products if they consume too much. Over 100 people have left reviews about Nulo Dog Food on Amazon. Its average star rating clocks in at 4.6 out of 5 stars. Most people comment that the quality is excellent and that their dogs seem to enjoy the food. Many have said that Nulo brand works for their dogs with allergies. A few reviewers have said that their dogs experienced diarrhea or vomiting after eating Nulo. Overall, however, the feedback is positive. When you give your dog better nutrition, you’re helping to prevent your dog from getting sick. This can save you thousands of dollars in vet bills later on in your dog’s life. It can also spare both you and your dog the stress of dealing with a chronic illness. Nulo pet foods are “free” of a lot of junk that’s just not good for dogs. Their dry dog food is grain-free, additive-free, meat by-product-free, and artificial dyes-free. The recipes are crafted with natural ingredients you probably even have in your own fridge–like wild-caught salmon, free-range turkey and lamb, and fruits and veggies. The food contains animal-based proteins, low-glycemic carbohydrates, and concentrated mineral profiles help support healthy bones, muscles, joints, organs, and more. It also contains patented “BC30” probiotics to maximize digestion and maintain a healthy gut and immune system. 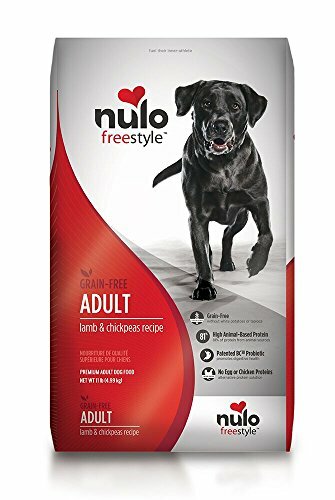 Nulo is considered a “premium” dog food brand. This means that its a lot more expensive than other brands. Nulo is made in the USA. The company has independently-owned factories in Kansas, Nebraska, and South Dakota. It’s sold online and at a variety of pet stores around the country. still am, appreciate it for putting up. General ingredients that include whole meats, fruits or vegetables in their top 5 ingredients are considered good foods. Those that also incorporate antioxidants like blueberries, cranberries, pomegranates and pumpkin are also becoming popular. With that said, organic, natural and preservative- free with no artificial ingredients, are also key to a well- balanced, and high quality dog food. Always ask yourself these questions: Is my dog suffering from any health problems? What life stage is he or she at? Veterinarians recommend that dog owners have a better understanding of their dog’s health issues and life stage before choosing a dog food. Ingredient analysis on all dog food products is important. Look for a high-quality dog food that will improve your dog’s quality of life, and allow for longevity. We are always updating our posts with the most current information and reviews. Here’s another great tip! Dog food formulas should contain antioxidants, Omega 3’s, healthy ingredients, and a balanced diet for the appropriate life stage. Always opt for a high-quality dog food! Your dog’s well-being depends on what you feed him. So important! Keep visiting! Here’s another great tip!A well-balanced dog food should use real meat/chicken/fish/ as its first ingredient. It should also not use harmful preservatives, flavors or artificial colors. Keep visiting! Thanks for connecting to Mysweetpuppy.net. Please keep in mind that I, Claudia Bensimoun, do not write any of the blogs or reviews on this website, nor have I in the past. I only answer the comments section.Here’s another great tip.Dog food should not be made in China, nor should any of the ingredients originate from China. With nearly 80 million dogs in the U.S, it’s important to consider why large-scale pet food companies have recently become more concerned with better nutrition.Here’s a great tip when choosing a dog food. Vitamins and amino acids should not be synthetic, and organic should mean that all of the ingredients are organic, including vitamins and minerals, and not just a few. A well-balanced dog food should use real meat/chicken/fish as its first ingredient. It should also not use harmful preservatives, flavors or artificial colors.The dog food formula should indicate what life stage it is intended for.